Although I wrote everything I know about squirrel issues for this website, oftentimes a problem with squirrels in the attic is beyond the scope of the do-it-yourself homeowner to solve. I have found a professional company in Milwaukee, Wisconsin that handles problems with wildlife. 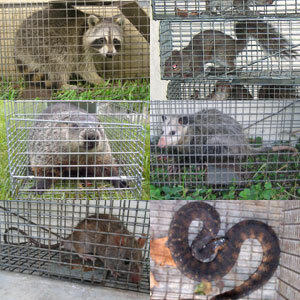 AAAC Wildlife Removal has access to tools, techniques, and experience that help them do a far better job at wildlife removal than a non-experienced homeowner could. They possess licensing that allows them to do certain types of work legally, that non-licensed homeowners in the state of Wisconsin are not allowed to do. For the welfare of your situation, and the squirrels, in some cases it's best to hire a pro. There are good companies and bad companies out there. I've done research on such companies, to get to know them, and feel confident recommending their services. I therefore recommend a company called AAAC Wildlife Removal which services Milwaukee, Wisconsin. If you have a squirrel problem, or any other conflict with a wild animal, and live in Milwaukee, I am confident that this company, AAAC Wildlife Removal, is the one to call. I asked the company to describe their service range, and they said this - We service the greater Milwaukee WI area, including the towns of Brookfield, Waukesha, Monomonee Falls, Hartford, northwest to Watertown, and more. AAAC Wildlife Removal operates 24/7, so don't hesitate to call at any time to discuss your wildlife problem, and schedule an appointment for same-day or next-day service. Hi, I have squirrels in my attic. I have a small leak in my roof and so I went up in the attic after a big rain to see if I could find the point of entry. While there I saw some rubber that had been chewed off of a pipe from my new air handler I had installed a couple of years ago. I knew I had a critter and probably a mouse since we have plenty around here. I have placed a trap with a peanut in it by the pipe, should I use sunflower seeds instead? I actually heard the mouse the same day moving quickly by the outside wall. The speed in which he was moving made me think it was running along the top of my soffit boards that extend past the exterior wall. He was moving to fast to be crossing over trusses. Anyway, I just put new soffit metal over my vents and don't know of anyway a mouse can get up in there. I was told they can't walk upside down. However, I have taken one soffit vent off in the front of the house to look for the leak. There are no trees for them to drop on the house and the only possible way in would be that metal soffit screen I removed. My exterior walls are smooth and I was told they can't run up smooth surfaces. I found your site and thought you might be able to give me some insight. It's buttoned up tight other than that soffit I removed, but unless they can climb smooth walls and then go upside down under the soffit, I have no idea how it would be getting in. Thanks, dv.. If you have a squirrel problem in Milwaukee County Wisconsin, or any other conflict with a wild animal, I am confident that we can solve it. We use humane methods when dealing with Milwaukee wildlife removal situations. Squirrel Control Milwaukee. Our company is fully licensed and insured in Wisconsin. Call us any time at 414-316-6510 for a price quote and to schedule a same-day or next-day appointment to solve your squirrel problem in Milwaukee.